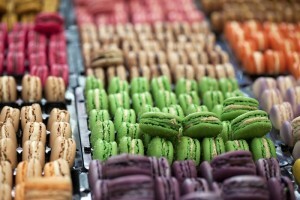 Imagine being asked to go and taste a variety of cakes and macaroons, made by one of the UK’s leading patissiers. Just imagine for a minute that you LOVE cakes and desserts and chocolate, and your good friend asks if you would like to accompany her to this fabulous tasting. Now just take a moment, if you will, and imagine that the poor girl who was counting the days before we went to have afternoon tea at Julien Plumart’s Boutique Et Salon De Thè, had to go to A&E on the morning of the day in question. And in her place, her equally greedy and gluttonous brother filling her place. A terrible story yes, but one that my good friend Christabel had to live through the day I went with Byron and my daughter to Duke’s Street to have a wonderful afternoon. 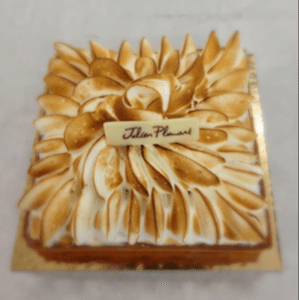 Julien Plumart’s Salon De Thè has been rated one of the best tea rooms in the UK, he himself trained under and worked alongside Raymond Blanc, and it really didn’t disappoint. Just walking through the door was a magical and exciting experience; the bright shiny colours and the variety of treats on offer was staggering. I was like a child in a sweet shop – it was like walking into The Weasleys joke shop in Diagon Alley, or being in Willy Wonka’s chocolate factory (in the Gene Wilder version). The counter seemed endless and I realised I was wide eyed and open mouthed gawking at it all, as was my two year old daughter. We climbed the bright red winding staircase to the tea room upstairs, and took our seats. It is a very bright and airily designed room, with clean lines, red roses on each table and sparklingly fresh white crockery; heart shaped sugar bowls and clear glass teapots (hot water being supplied in a silver thermos). We looked at the menu. 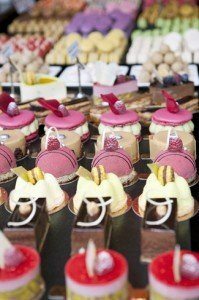 Not only do they offer a massively wide range of cakes and sweets and a staggering 24 uniquely designed signature macaroons, they also do breakfast, lunch, sandwiches and other Parisian light bites. 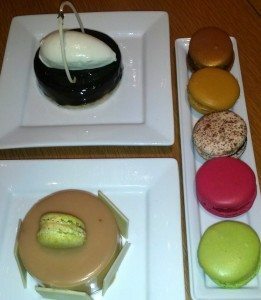 I had no idea where to start, I was dizzy with excitement and so we decided that it would be best for our beautiful French waitress to bring a variety of delights for us to share. Hmmmm. It is important that I say here that I’m not overly fond on macaroons. There, I’ve done it. Past experience has taught me that they are sweet, taste of nothing but sugar and absorb any moisture in your body leaving your face sweet and your mouth arid. I am now saying, categorically, that is absolutely not true. 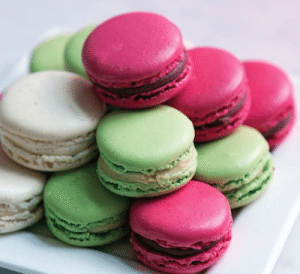 These macaroons are creamy, chewy, crisp and an absolute delight in your mouth. The noises at our table were all extremely happy ones as we cut delicately into each morsel and delivered them from dainty fork into our expectant and contented mouths. Poor Christabel, we said, missing this, life just isn’t fair. The pistachio was sweet and creamy, the raspberry macaroon a perfect raspberry delectation with its fruity tang. The Black Forest recreated the taste of the old family favourite with rapturous accuracy, and perfectly complimented the salty caramel with it’s chewy salty crunch, and finally the dark and soft Grand Cru Chocolate was sweet and enchanting. They were all gratifyingly chewy and satisfyingly naughty – the whole experience was reminiscent of Alice in Wonderland or some similar type of girlie fairy tale, we were cutting them carefully into quarters with our teeny shiny cutlery and gobbling them up. Our waitress had cleverly chosen the final treat in the guise of The Ultimate Dark Chocolate Tart. With its silky smooth dark 64% chocolate ganache and Chantilly cream coated in white chocolate, it was absolutely heavenly. I can’t begin to describe the audible enjoyment we were all experiencing from it – I apologise to the other customers, I imagine it must have been quite off putting. 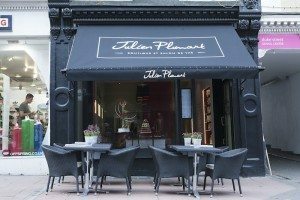 If you, like me, enjoy afternoon tea and love a cake, you’ve simply got to get yourself to Julien Plumart’s. It’s a very special experience, enchanting and magical, the range of teas is extraordinary and the colourful, imaginative and beautifully crafted treats are a joy to behold and even better to taste. It really is delicate, beautiful, magical perfection. Keep an eye on Julien’s website – as he is soon to reveal his online delivery service, just in time for Christmas.